(July 26, 2017) WhatsApp hit a major milestone today – more than one billion people around the world use WhatsApp every day. With just so many people in the world (7 billion to be approx) it means every, one in seven people use WhatsApp every single day. The name says it all. 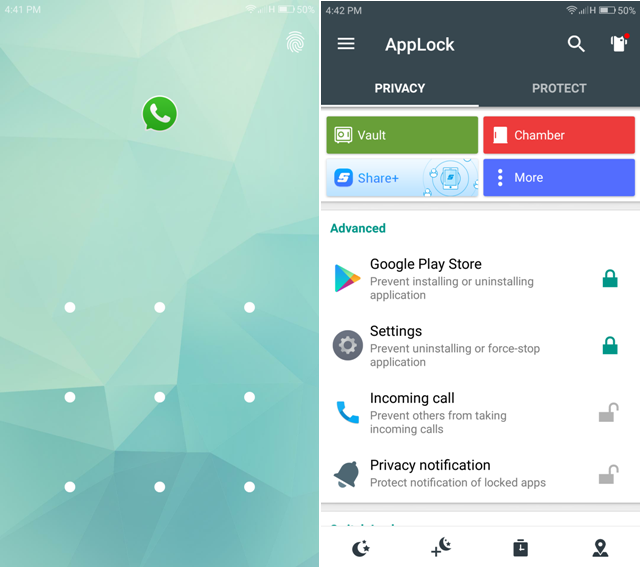 It’s an app locking service that will protect your WhatsApp privacy. Most of the app lockers have a problem that they can be uninstalled but this app asks for a pin to do that. You can lock apps with a fingerprint, pattern or a pin etc. The app also has a feature which can hide the app icon from the app drawer and to access the app you either have to dial “#1234” or enter a specific URL in the browser. The only con is that it contains pop-up and banner ads. WhatsApp is the main source of media coming into our devices, most of which are funny videos, memes, spam pictures, and duplicate files etc. Most of the media is not even important and just takes place in our phone’s storage. The app features a simple and colorful interface. 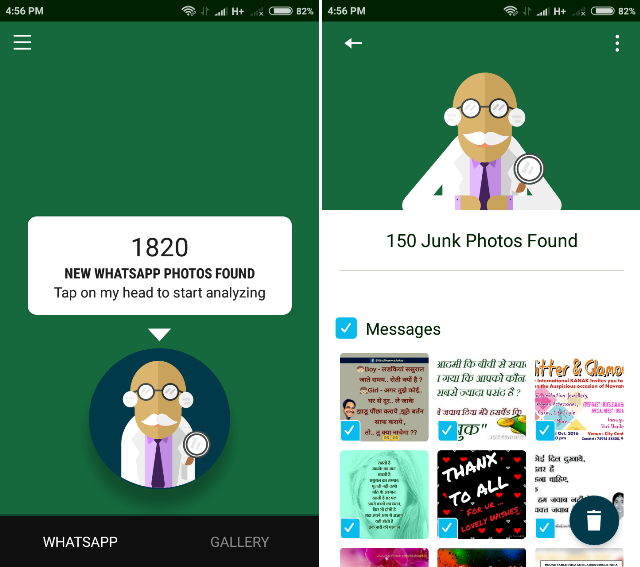 It analyses your WhatsApp data, sorts them into images, videos, profile pictures etc and then checks them for duplicate, junk files. Select multiple files, see previews and delete them easily. The app is free and contains zero ads. We hate Facebook Messenger for being forced on us and on how much ram and storage it uses but we all love its chat heads. 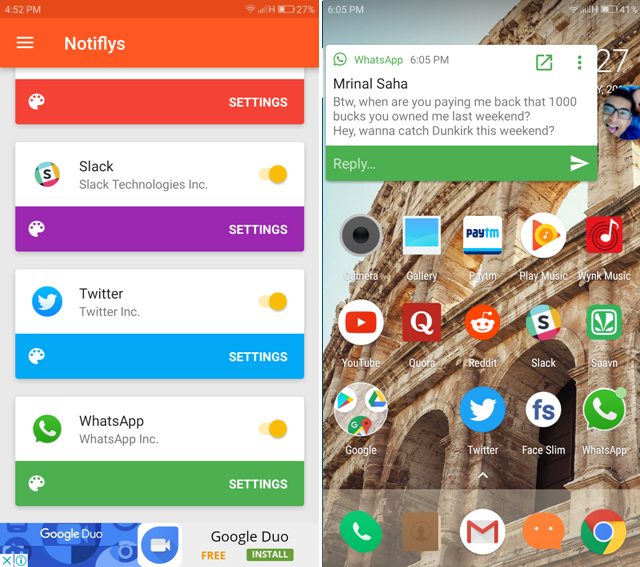 Notify enables those beloved chat heads to WhatsApp, Telegram, Slack, and Gmail etc and you can even control their size. The free version comes with basic features and contains ads, to remove them and to get advanced features; you have to make an in-app purchase of few dollars. 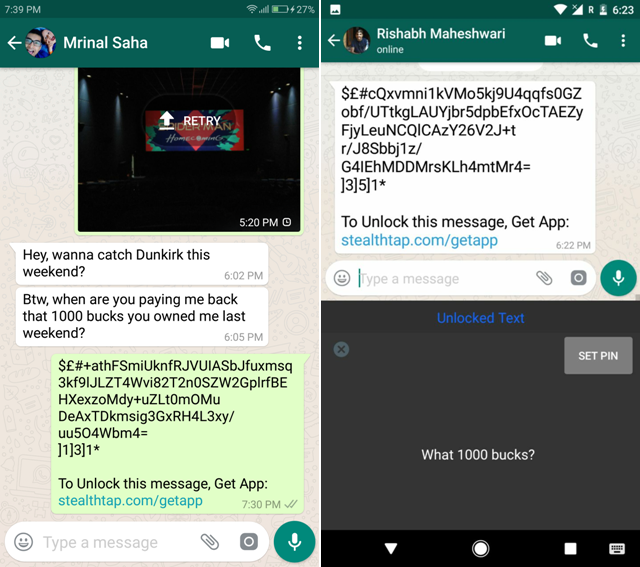 So if you’re a person who wants to have super secret chats and don’t feel secure even using app lockers, then StealthTap Keyboard app is for you. 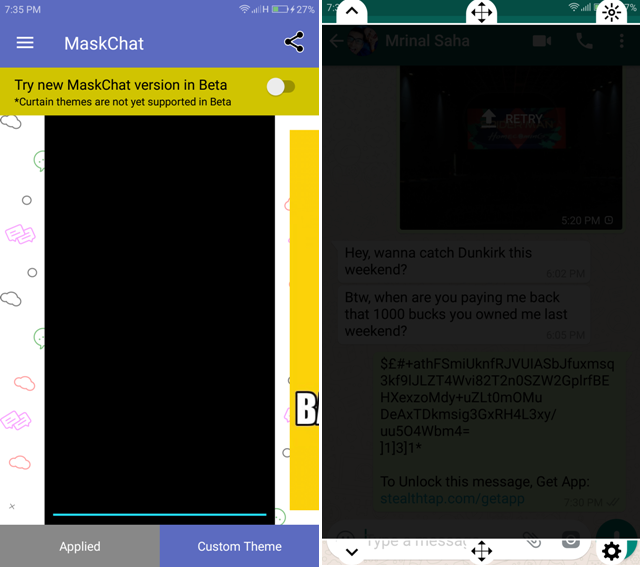 It’s a keyboard app which can encrypt your messages. You just have to type the message, press the lock icon and then send it, your partner has to copy the message and press the unlock icon, the message will show. That means both you and your partner should have this app. But if you want a complete encryption app then check the pijaret app. One of the biggest shortcomings of WhatsApp is that it doesn’t allow non-square pics to be used as profile pictures and we all have been waiting for this to solve as it got solved for Instagram but seems like the developers or Facebook is busy stealing features and have no interest here. 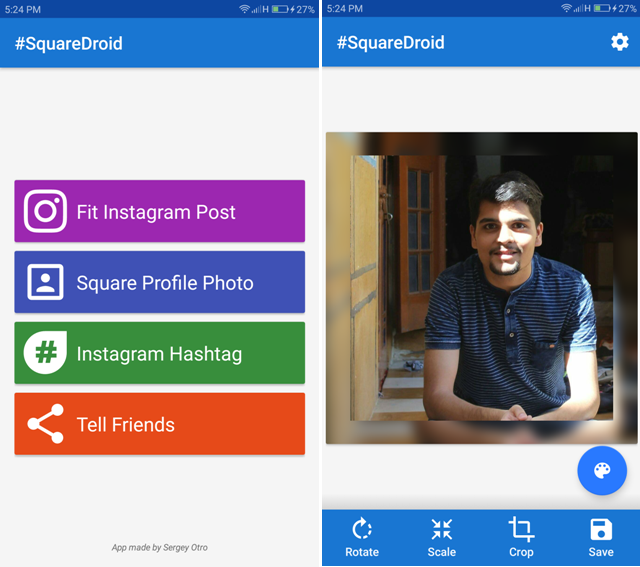 But no worries, we have the SquareDroid app, using this app you will be able to use any picture as your DP without cropping it, instead it will get a blurred background which will make it square-shaped. It contains pop-up and banner ads. Note: Installing Xposed modules require root access. Is it only me or the status tab in WhatsApp also annoys you or the camera button gets clicked by mistake when you begin to type or you want the call button to call through phone and not to make a WhatsApp “call”. If you feel familiar to these pains, then fret not we have a savior. 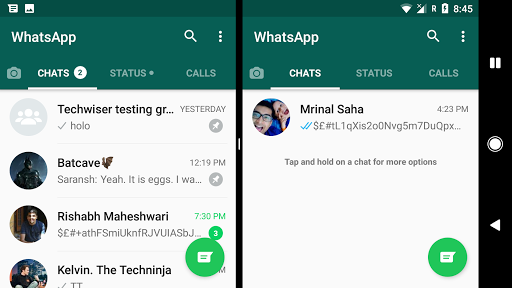 WhatsApp Extension is a Xposed module and you have to download this app from Xposed module app. For those who don’t know what is a Xposed module and how to install it? Here, we have an article on that. Every other brand is now launching dual SIM smartphones, some people use one SIM for Business and another one for the family. 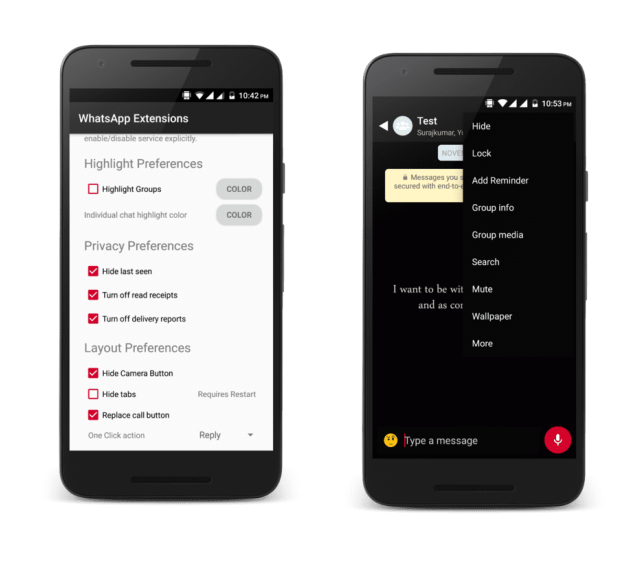 Just like that lot of people want to have two WhatsApp to cater their professional and personal needs. And Parallel Space comes to play here. It can create two instances of the same app, on the same phone. Both accounts will be online Simentenuously. It also comes with privacy protection and can lock itself with fingerprint/pattern. The app is free but contains ads and if you have 64Bit chip phone, then also download the 64 Bit Support app. Have you ever seen a bobble head figurines? This app creates those bobble head Emojis with your face. Just click a selfie, perfect the face outline and hair. And then it gives you a list of Emojis, GIFs that you send in any messaging app. You can create bobble Emojis of friends too by just using their pictures. The app is free and has zero ads. GIFs are all over the internet, every day we see a new GIF trending. And now we can send them to most of the messaging platforms too. But there is a way to fill them with more fun. 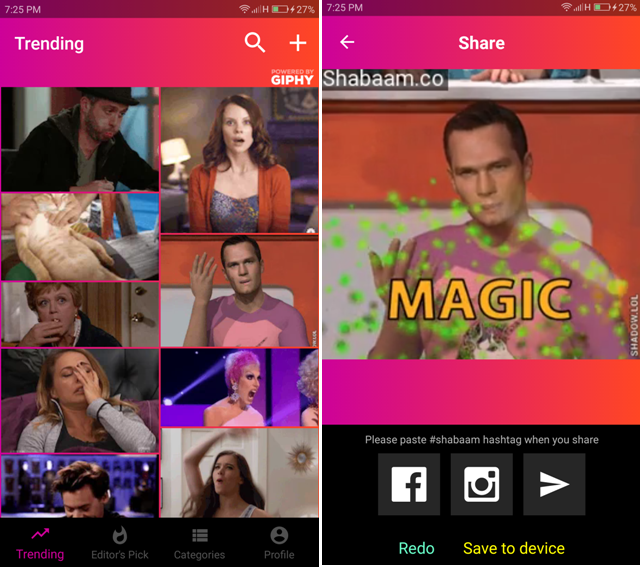 Using Shabaam, you can add audio to a GIF, just select a GIF from the list given, add your audio and send. Shabaam shows trending; Editor’s Pick GIFs and even has categories for them. It’s free and has zero ads. Have you ever been in a situation where you want to listen to a personal voice message but don’t have the earphones and your phone’s speaker is too loud? No worry, you have a savior. 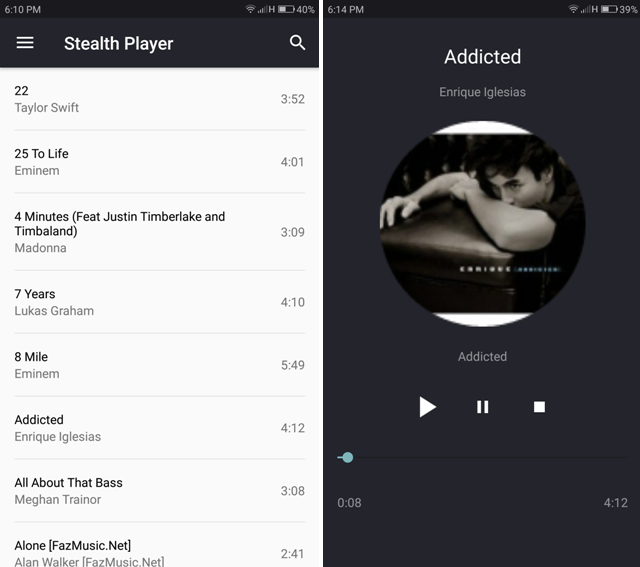 Stealth Audio Player plays any audio or video file through your phone’s earpiece and not from the main speaker. So you can pretend like having a call and listen to the message. The app is free but contains ads. Ever wondered which word you use the most in a conversion or how much media you share? Now, you can find that out. 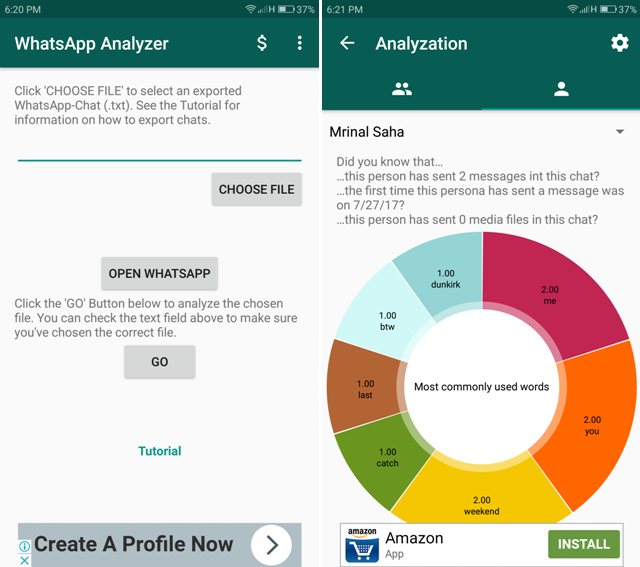 WhatsApp Analyzer finds which word you or partner uses the most or which one has sent the highest number of media files. Just open the app, choose the text file and tap on GO. The app is free but contains ads. 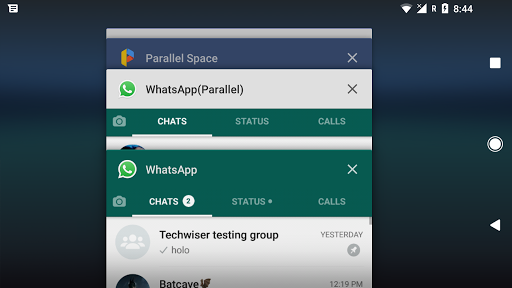 Whatsweb can run two WhatsApp account on the same device, but it doesn’t create a clone app to do that. 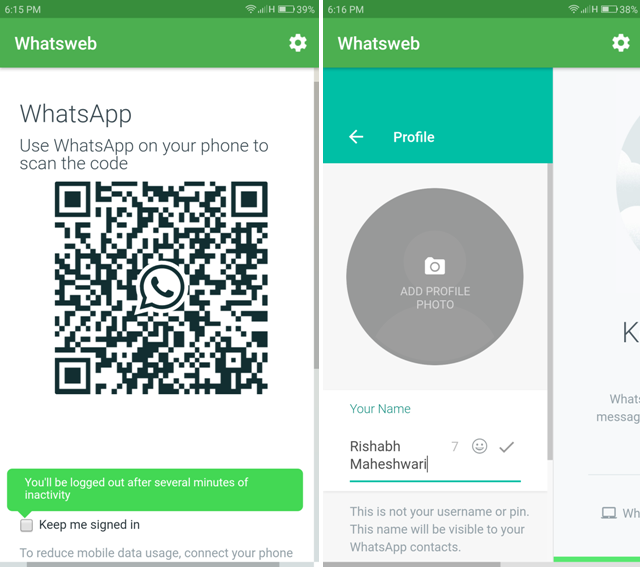 Whatsweb opens the WhatsAppWeb site, and if have ever used that before, you know that you just have to scan a barcode and it shows all chats. So if someone’s phone has less juice left and they have to do an important chat then they can just use this app on some other phone and do that. The app is free but contains ads. Though you can do that by just open WhatsAppWeb on Chrome app using desktop mode. But the app makes it easier. We always get in a situation where we are chatting on WhatsApp and people sitting near us starts to peep. First of all, if you’re that kind of person then please stop it but if you feel the pain, then the app is for you. This app puts a black filter on the screen, so can peep around. Just launch the app, adjust the filter size, it’s intensity and lock it. Those peeping heads will never be able to see your chats. The app is free but contains ads. 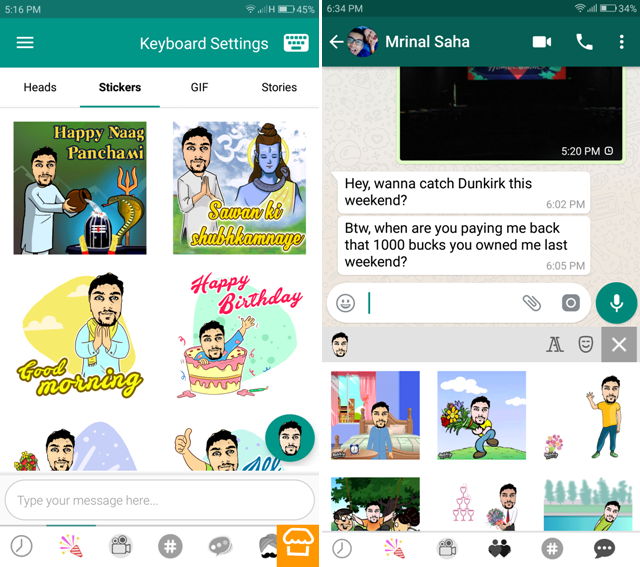 If you feel like pranking your friend on WhatsApp then use Primo and Parallel space duo. With Primo, you can get a free number (which can receive a text message for number verification) and later activated on Parrell space. It’s like having 2 WhatsApp account on the phone when you don’t have a second number. We tried Primo and it worked flawlessly, although you’ll have to register with your mobile number and verify your email address to get a free mobile number, which is again only free for next 14 days. Though WhatsApp has some shortcomings, still its users are loyal to it because of its simplicity and the fact that everyone is using it. But these apps surely will make WhatsApp better. I liked the Siftr Magic Cleaner the most as it’s ad-free and saves space. Tell us which one is your favorite app or you know some other app that should have made it to our article in the comments.